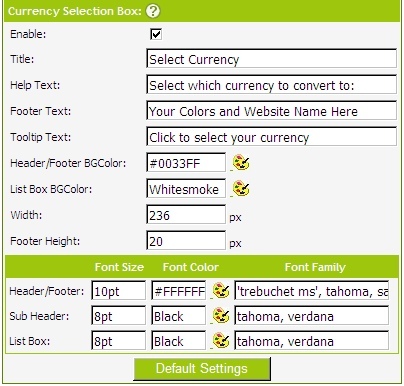 The SETUP menu allows you to get started configuring your options to allow you to implement the various features of the YourCurrencyConverter.com system into your website. It is also where you will return to, once everything else is set up, to copy and paste the finished implementation code (called SCRIPT TAG) into the code of your website. Clicking ony any of the "?" question mark characters will give you help in the right hand HELP window situated under the "Examples:" windows. The "Examples:" window shows you what should happen to the prices on your page as you configure the options. Figure 1.0 Your Site Details. The script that will be returned to your site is created specifically for YOUR website. You must enter the domains for your website (see Figure 1.0) seperated by commas. If your website can be found with and WITHOUT the "www." then you should include the domain WITH and WITHOUT it (as shown in figure 1.0). If your website can be found by more than one domain name then you also should enter these here, seperated by commas. Remember to include pages such as secure checkout pages ie. secure.yourdomain.com etc. This is YOUR currency that your site currently displays i.e. If you are in the United States (as shown in the example in Figure 1.0) you would select US Dollar - USD, if you were in Australia you would select Austrlian Dollar - AUD etc. YourCurrencyConverter.com uses geographic IP location techniques to determine the correct currency for visitors to your website. Occassionally (less than 0.2% of queries) the system will be unable to determine the country of origin of your visitor. In this instance a DEFAULT currency conversion will be shown. Select which currency you would like your prices converted INTO if the country cannot be determined. i.e. If you are in the United States and you sell MOST of your overseas orders to Europe you would select Europe - EUR. 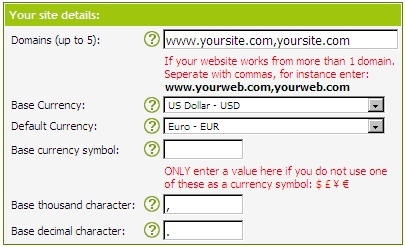 If you want NO currency conversion to be displayed if the visitors IP address cannot be determined then simply set the DEFAULT CURRENCY value to be the same value as your selection for CURRENCY. This will allow our page scanning to detect your prices once you enter the correct symbol used in your base currency. Example: If your base currency is South African Rand the symbol is R and all the prices are displayed on your site as R100.00 then by placing R in this field will allow our page scanning to detect the prices displayed on your site. Alternatively if all the prices displayed on your site as ZAR100.00 then by placing in ZAR in this field will allow our page scanning to detect the prices displayed on your site. Enter the thousands separator character for the base currency. Example: If your base currency is Euro then the format for your prices may be € 10.500,50 so this fields setting will be '.' (period). This will change the way YourCurrencyConverter detects the prices on your site. If your prices are not displayed in this format they may be interpreted incorrectly. Place in the decimal separator character for the base currency. Example: If your base currency is Euro then the format for your prices may be € 10.500,50 so this fields setting will be ',' (comma). This is by far the easiest of the scanning options because when selected your entire HTML page will be scanned and any currencies that match a valid currency pattern will automatically be converted. The match requires a valid currency symbol determined by the selection previously made in the Currency section detailed above and then a number, this number can contain commas and up to two decimal places. If your page does not follow these rules, i.e. you may have the currency symbol in a different table cell or perhaps your page is displaying multiple currencies, then there other options available. If you display multiple currencies on your website then a popup converter would suffice. Alternatively for more specific control the use of SPAN tag scanning would be the favoured solution (details below). Sometimes you may want to use auto scanning but have some prices on the page that you do not want converted. This can be achieved by adding a yccNoConvert SPAN tag around the price that you DO NOT want converted. To prevent the following amount being converted. See the Exceptions section below to learn how to exclude certain tags on your page from conversion. This is a more precise form of scanning and you can place certain amounts (prices) within SPAN tags and these amounts (and only these) will be converted. This is useful if your page doesn't conform to the currency match pattern outlined in the auto scanning above. To use SPAN scanning simply place an amount within a yccConvert SPAN tag. Due to the nature of the scanning some of the formatting options outlined later in this document may not be as effective. Because we offer a whole suite of tools designed to give your website more of a global appeal you may not want to use the currency conversion option but instead want a currency popup or perhaps make use of the visitors Country Name or display their Country Flag. In these cases you can opt to turn the scanning off. When auto scanning has been selected, this section determines rules for sections of your page that will NOT be converted. Generally speaking you probably won't want text with <h1> tags to be converted as they will be page headers so having <h1> selected will prevent this from happening. Figure 1.3 On Page Conversion. For a full list of supported currency codes in a new window please click here. Figure 1.4 Currency Selection Box. When this option is enabled the prices on your page will be contained within an anchor tag (made into links) which will allow the use of the currency selection popup box. You may want to disable this option if you wish to use an alternate method of currency selection, for example flags, buttons or a drop down selection box as per section 2.4 above. You can modify the look and feel of the popup to match the website you are integrating with. You'll be able to see the color changes and text changes you make appear in the preview contained in the "Examples:" window on the right. The currency selection pop up is only supported when using the Auto Scan page scanning option. Figure 1.5 Currency conversion display format. This section will determine the overall appearance of the conversions on your web page. Please note that some of the features listed below may be incompatible with SPAN scanning. All formatting options will also affect your base currency. This option allows you to enter the text you would like to appear when the visitor's currency is the same as your website's. For example if your website's base currency is US dollars and your visitor is from the US, what you would like your customer to see. This will only appear if you have selected On Page Conversion. The first two text boxes allow you to enter text or HTML to determine the way you wish the converted amounts to be displayed. Figure 1.6 Currency conversion display format results example 1. Figure 1.7 Currency conversion display format results example 2. Figure 1.8 Currency conversion display format results example 3. When the visitors selected currency is the same as your base currency, the 'Same currency display' text is shown. If this option is selected, then the 'Before currency display' and 'After currency display' will also be used. 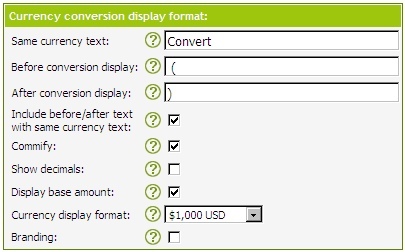 For example, lets assume that the 'Same currency text' value is 'Convert', 'Before conversion display' is '(' and 'After conversion display' is ')'. With this option ON, the before and after conversion display text is used, in this example, placing brackets around the text Convert. Determine whether you would like your currencies to be displayed with commas. Determine whether you would like your conversion displayed with decimals. Determine whether you would like your base amount (i.e. the amount on your page that is going to be converted) to be displayed along with the conversion. We give you the option to remove your base amount and replace it with the conversion but we would generally advise against this as the conversion is only an indication and the exchange rate used by your merchant services payment provider may differ. This could confuse customers. Any formatting options will affect the way your base amount is displayed. Determine the way in which you would like to display the base amount and converted amount on your web page. You can remove the www.YourCurrencyConverter.com branding from their web pages. When you add the script tag to any of your web pages our logo will appear at the foot of your page. We happen to love our spinning logo but we understand that some people may prefer not to have it. Deselecting this option will remove this link.. This is the section that will enable you to start enjoying the benefits of the tools we offer. Cut and paste the script tag in the text box, without altering it, into each page you want YCC to perform a conversion or supply data. It must be placed at the base of each page just before the </body> tag. If you are using a shopping cart please refer to our Cart pages from the green menu above - if your cart is not listed then try using the Generic Integration option. Any alterations to this tag may result in the service failing or a dialog box appearing on your site asking you to correct it. Contact support if you are having difficulties.